ABOVE: Waiting lines at popular attractions can cut into your vacation time, so bail out and explore Venice's quieter back streets when the mobs become unbearable. 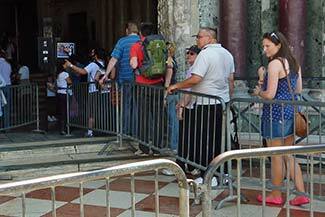 The Doge's Palace attracts group tours and mobs of individual tourists who feel obliged to see it, but during peak season or on holiday weekends, the entrance lines can be horrendous. Admission isn't cheap, either. Unless you have an irresistible urge to see large, ornately-decorated rooms with paintings by artists like Tintoretto and Veronese, you may be just as happy visiting places like the island cemetery of San Michele (inset photo) or the Naval Historical Museum at Arsenale, which is a few minutes east of the Doge's Palace along the St. Mark's Basin waterfront. The Rialto Bridge is an impressive sight, and you'll appreciate the views of the Grand Canal from its balustrades. Still, that doesn't mean you need to imitate the lemming-like crowds who linger around souvenir stands and have lunch at tourist restaurants near the bridge. You'll get a better feel for Venice (and suffer fewer bruises from other tourists' elbows) by heading inland from the Grand Canal and exploring typical Venice neighborhoods. Bottom line: Instead of following the crowds or a guidebook author's itinerary, follow your instincts and inclinations. Your best holiday memories are likely to come from watching daily life in Venice or discovering Venice's lesser-known sights on your own.